OVER MANY YEARS I have built up a practice of taking audio recordings of talks and discussions at meetings, then editing and processing them into MP3 files that can be placed on the Web for streaming or downloading. It has always seemed a shame to me that so many organisations attract excellent speakers, whose lecture is listened to by a few score people at most, when it is so easy to use a little technology and skill to keep their words ‘in orbit round the globe’, for years and years after. As a member of the Specialist Groups community of the British Computer Society, much of my recording work has been done for BCS groups and branches. I also regularly record at meetings of the International Society for Knowledge Organization (UK chapter), and in 2009 we replicated thus more than half the presentations at their first ISKO-UK international two-day conference. One of my most recent audio-recording projects, which came out to the great satisfaction of all concerned, was a highly dynamic presentation on ‘Conquering the Imposter Syndrome’, given by executive coach Deena Gornick to a joint meeting of BCSWomen and Women in Technology. I edited together the choice bits of presentation with some interview segments between Deena and Women in Technology’s Maggie Berry, and you can now listen to the result from the WiT Web site. Incidentally, my ability to make this recording relied heavily on the technical capabilities of my new Marantz digital recorder, which is what this blog post is really about! I also create explanatory and documentary videos, and a good quality audio recorder is very useful in preparing the narration track. Somewhat similar is a ‘slidecast’, Slideshare.net’s term for an audio narrative synchronised to a set of slides on their online hosting service. I wrote about my experience of making one of these a while back on this blog. I’ve used a variety of tape and disk based audio recording devices in the last 15 years, including four MiniDisc machines, but in the last three years I have switched to devices with solid-state memory for storage. To transfer a 45-minute recording from MiniDisc or DAT tape to a computer for editing takes 45 minutes; but with these new-style devices, the recording is laid down in memory as a WAV or WMA or MP3 file, and is transferred to the computer in seconds, which is already an advantage. I wrote about my ‘slidecasting’ experiment at a time when my main system was a well-designed but bulky and increasingly unreliable HHB MiniDisc recorder; my solid-state device, which I actually used for the slidecast, was a little handheld Olympus DS-50 voice recorder (a superior dictaphone, if you like). 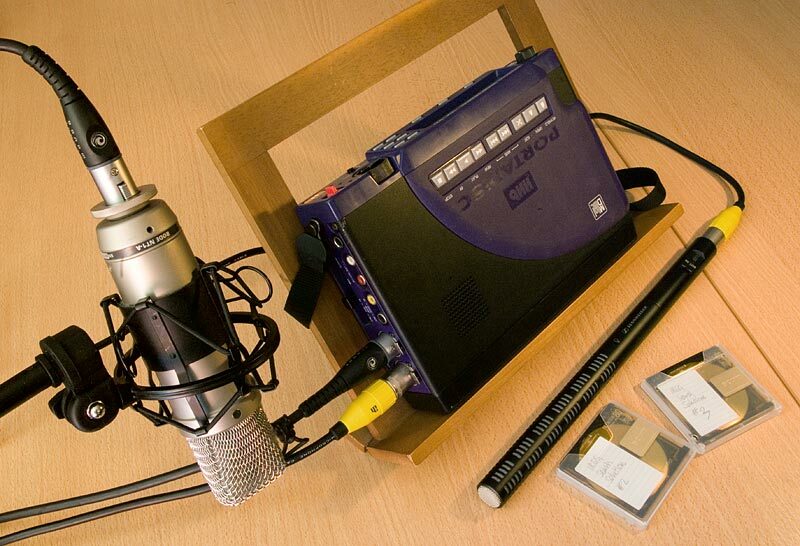 HHB MiniDisc recorder with Røde studio mic in foreground and Sennheiser shotgun mic below. 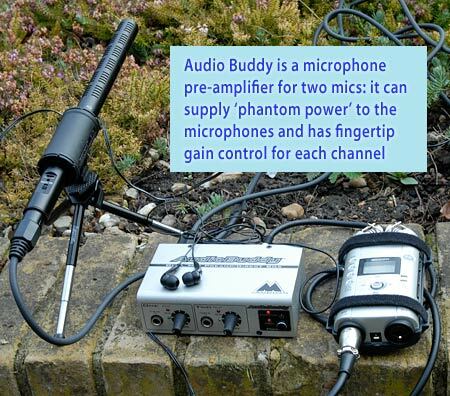 The advantage of the HHB (when it worked) was its ability to take input from two independent external microphones, providing them with ‘phantom power’ if the mic technology needed it. 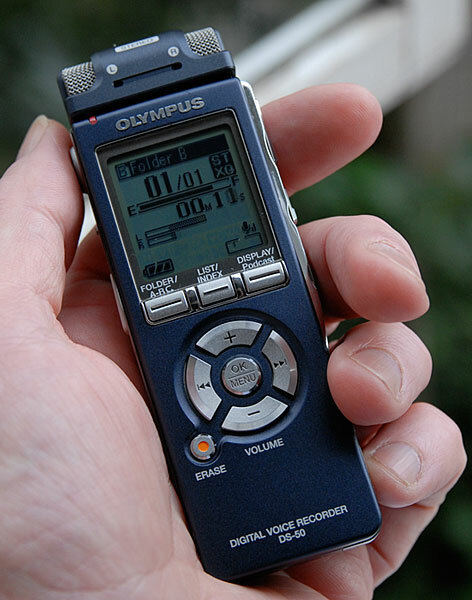 As for the Olympus DS-50, it is a remarkably effective device for its size, and I always carry it about with me; but it can use only its own microphones, and because its internal memory is fixed at one gigabyte, it has to make use of a compressed audio data format (WMA) internally. Because SDHC storage is so capacious and speedy, many digital audio recorders now record uncompressed audio with a fidelity which in the past was associated only with DAT tape or hard disk recorders. The Olympus LS-10, for example, can record 24-bit WAV stereo files with a sampling frequency of 96 kHz. In January 2009, I was on the look-out for a solid-state digital recorder which would be able to ‘inherit’ the full set of microphones from my now-abandoned HHB MiniDisc machine. I have two Røde large-diaphragm studio condenser microphones, which deliver outstanding clarity when properly mounted and positioned, plus a Sennheiser ‘short shotgun’ microphone which is extremely directional, and is my typical choice for video work. 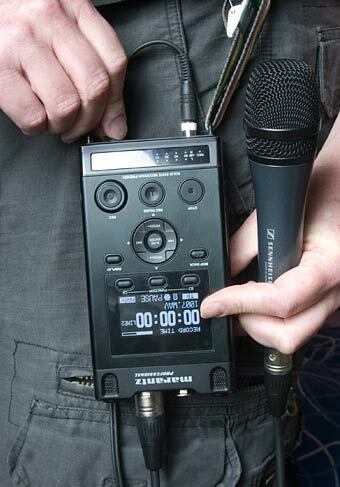 I also have a Sennheiser Evolution e85 handheld dynamic mic which is more suited to reportage situations. I took advice from a Soho shop for musicians, which in retrospect was a mistake. They convinced me that the Zoom H4 recorder was a world-beating favourite. I bought one (but not from them; Studiospares is always cheaper!) and started to experiment. Feeble pre-amps. This is why asking a music shop for advice was such a bad idea. The Zoom H4 is a great favourite with bands who want a convenient small device with which to record their practice sessions, and those guys are LOUD. They don’t need the microphone signal to be boosted much, whereas someone recording meetings really needs substantially greater pre-amplification of the incoming signal. Greedy for power. The Zoom H4 can be powered from a pair of AA batteries, but it drains them very quickly, especially if you use NiMH rechargeables. That might be OK for recording four-minute songs, but not for two-hour meetings. Dreadful interface. I have used the Zoom H4 in lectures as an example of the difference between ‘functionality’ and ‘usability’. Its fiddly switches and jog dial, and the tiny LCD display with anaemic backlighting, make it a real pain for an older and somewhat long-sighted person like me to work with. Not built for ‘the field’. There’s no way to attach a carrying strap to the Zoom H4, it doesn’t sit securely on a table, and the build is rather fragile. I was able to solve the first two problems (for example when recording for ISKO) by plugging my microphones into a separate portable ‘Audio Buddy’ pre-amplifier, and powering each of these devices from their power packs, plugged into mains power. Then I would take line-level input from the Audio Buddy into the audio recorder. This set-up has the added benefit that the Audio Buddy has a separate, easily adjusted gain control knob for each input channel. My ‘ideal’ mic set-up for a lecture is to put a quality Røde condenser mic near the speaker, on the ‘main’ channel, and keep the short shotgun mic beside me (suspended in a Rycote hand-held shockmount) on the second channel. I keep the gain on the secondary channel turned down until I need the shotgun mic to pick up questions from the floor, or to re-inforce the primary audio if the speaker wanders away from the microphone. So, I had a workable solution. But it was annoying to find that the Zoom H4 was, in effect, only usable when I had access to mains power, and it also necessitated dragging extra gear along to each meeting where I was invited to record. These experiences prompted me to do my research more carefully this time, and to pay particular credence to the opinions of field recordists and radio journalists. My choice at the beginning of this year was a Marantz PMD661 recorder, and my experiences with this machine have all been positive so far. Marantz PMD661, suspended from my belt with an Arno strap. The cable from my dynamic interview mic is plugged into the ‘bottom’ of the device, and I am adjusting the gain knob. Compared to the Zoom, the Marantz is more than twice as expensive, twice the volume, and perhaps three times the weight; but even so, that’s quite compact, smaller and much lighter than a digital SLR camera. The Marantz is built substantially, and the control surfaces are laid out ergonomically for two main modes of use: horizontally, with the device set on a table, or suspended vertically on a shoulder-strap through the strong metal connection loops. Latterly I’ve been keeping an Arno buckle-strap through one of the loops, and clipping that to a carabiner on my belt. On the broader control surface (the ‘top’ in horizontal use mode), there is a large legible OLED multifunction display, and coloured LEDs signal the recording status and the sound levels of the two recording channels: all very useful when recording in low light levels. The Record, Record-Pause and Stop buttons are all comfortably thumb-sized. The narrower control surface, which is the ‘top’ when you have the Marantz at your side, carries the quarter-inch jack socket for headphone monitoring, the headphone volume control, and concentric recording-level adjustment dials for the two channels. You can operate these by feel alone. Whichever way you use the Marantz PMD661, when its interface is oriented towards you, the XLR sockets are at the side facing away from you. I can understand why the Zoom is configured the other way round, but it doesn’t make for convenience in the field. In addition to the XLR inputs, which can be set as ‘line’ or ‘mic’ or ‘mic with phantom power’, there is also a competent pair of inbuilt mics, a ‘digital in’ port (electrical S/PDIF), and a secondary ‘line-in’ port for a 3.5 mm stereo microjack. I use this last when recording from my DAB radio. And here is the all-important news: the microphone pre-amps in the Marantz are excellent! They are so powerful that I have been able to bring my voice-coil dynamic interview mic back into use. I’m also able to use my favourite Beyer DT-100 monitoring headphones: the Marantz headphone amp is strong enough to overcome their 100-ohm resistance. Unlike the Zoom H4, the Marantz PMD661 can output through an inbuilt stereo pair of speakers. They’re not wonderful, but if you want to review an interview with your interviewee, they’re dead handy. As for the power situation, the Marantz takes four AA cells, either alkaline or NiMH (nickel-metal hydride). I use the new-style low self-discharge NiMH type, rated at 2300 mAh, and I can get more than two hours’ continuous recording (with phantom power) out of them. With alkalines, I’m good to go for over five hours free of mains power. In the settings menus, you can tell the Marantz which of these power options you are using – a feature I’ve not seen on any other electronic device. The importance of this is that NiMH cells start delivering power at 1.4V, but rapidly drop to 1.25V at 10% discharge, then maintain that voltage for most of the discharge period. Many devices (e.g. my DAB radio) interpret this low-voltage reading from NiHM cells as a ‘these batteries are flat’ signal, which ain’t true. Good thinking, Marantz! To record a conference ‘properly’, I’d still lug my Røde mic and mic stands, use mains power and even include the Audio Buddy in the loop; but now with the Marantz I have the additional capability (a) to ‘go walkabout’ at an event, which proved necessary for the Deena Gornick recording and (b) to keep a lightweight recording kit on me at all times, such as illustrated in the photos, in case something comes my way ‘serendipitously’. Finally, I must touch on one very peculiar ‘feature’ of the Zoom H4. One one or two occasions I have had a need to record the video of an event, but also capture the audio on a separate audio recorder (for example, one occasion when my filming position was at the very back of a lecture theatre and I wasn’t able to run a long cable from there to where I wanted the microphone to be). When I tried that with the Zoom H4 as my audio recorder, I found that its ‘sense of time’ drifted away from that of the video camera, making it impossible to synchronise the two recordings. Checking on the Web, I find that this is a well-known and much criticised feature of the Zoom H4. Incidentally there is now a new Zoom recorder, the H4a, which has vastly improved interface and control surface; but whether this particular glitch is fixed or not, I don’t know. Three days ago I was filming at a meeting in a London hotel, and for a slightly different reason this time I was again recording the audio separately, this time to the Marantz. I’m pleased to say that I was able to synchronise the audio to the video perfectly this time, using the Marantz audio and throwing away the camera audio. Another thumbs-up for the PMD661! At a recent social media networking meeting I did hear accusations of unreliability directed against the Marantz. Maybe I’ve just been lucky. Or maybe the critic was referring to the predecessor, the PMD660, which did draw a lot of flak, for example for the ‘noisiness’ of its pre-amp circuits. The PMD661 is a substantially redesigned machine drawing on the lessons learned from its predecessor, which I guess reinforces the message that you are generally better off not buying Version One of anything!